Huw Jones admitted the humiliation at the hands of Wales was a learning curve for the Scotland players before they turned in a gutsy performance to beat France. On the back of a 34-7 thrashing in Cardiff, the pressure was on Scotland to produce a more competitive effort against Les Bleus only for the hosts to suffer a nightmare start in Edinburgh. Teddy Thomas scored twice as France stormed out of the blocks and looked likely to condemn Scotland to another meek defeat, but, led by Greig Laidlaw - who kicked 22 points - they fought back to claim a 32-26 victory to put them back in contention in the NatWest Six Nations. Gregor Townsend's men could have easily folded following the nightmare in Cardiff, but they showed character to fight back, abandoning the free-flowing rugby that proved so successful in the autumn, and Jones was pleased with the response. "We learned a lesson in that you can go down a couple of tries but there is still plenty of time left to come back," he said. "Greig was instrumental. He brought a lot of calmness and his kicking was spot on every time. His leadership really helped." The defeat to Wales was perversely helpful to the Scots, who adapted their game well as the match went on to grind out a win that appeared unlikely after going 26-20 down with 20 minutes to go. "I think it definitely helped to focus the guys," Jones said of the Wales defeat. "That game brought us back down to earth a bit. We said we were confident going in, and we were, but to take a loss like that really brought us back down, so the tension helped to refocus our minds and get us ready for another tough game." Jones played a crucial role in the comeback, touching down for his eighth international try after picking a fine line from just inside the 22 to cut into a 10-point deficit after Sean Maitland had also scored for the hosts. 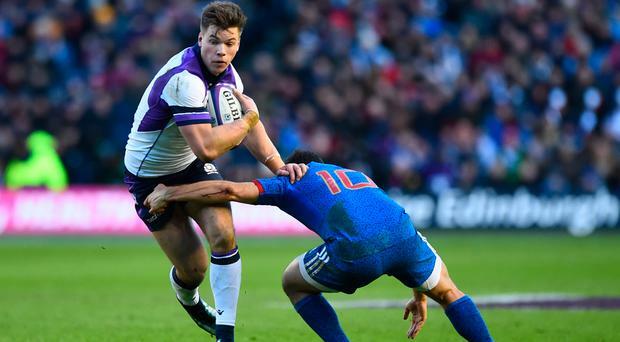 It was a welcome return to form for Jones, who prospered on his return to outside centre having shifted inside against Wales last week, and he was pleased to combine with Glasgow team-mate Peter Horne. "There has been a lot of hard work trying to get as many touches of the ball as possible," he said. "That's something I didn't really get last week. "You saw the rewards of that work rate." He added: "I've only really played 13 at international level, but I really enjoyed playing outside Pete. "He is like another playmaker and gives me opportunities to attack a little wider where I like to, so it was really good having him there." By Adam McKendry It was a gruelling season in Division 1B of rugby's All-Ireland League, and the final standings proved how evenly matched all the sides were. Three weeks after fearing his season was over Brad Barritt will captain Saracens in Saturday’s Champions Cup semi-final against Muster. By Cian Tracey Ireland captain Rory Best says his children will find it hardest not to be able to walk onto the hallowed turf with him following retirement. By David Kelly in Dublin Every sporting professional desires to delay the inevitable day when they must call time but theirs is so often a forlorn plea.